Failure of the immune system to eradicate viruses results in chronic viral infections, which are associated with increased susceptibility to secondary infections. Pathogenic HIV or lymphocytic choriomeningitis virus chronic infections display a persistent type I IFN signature. 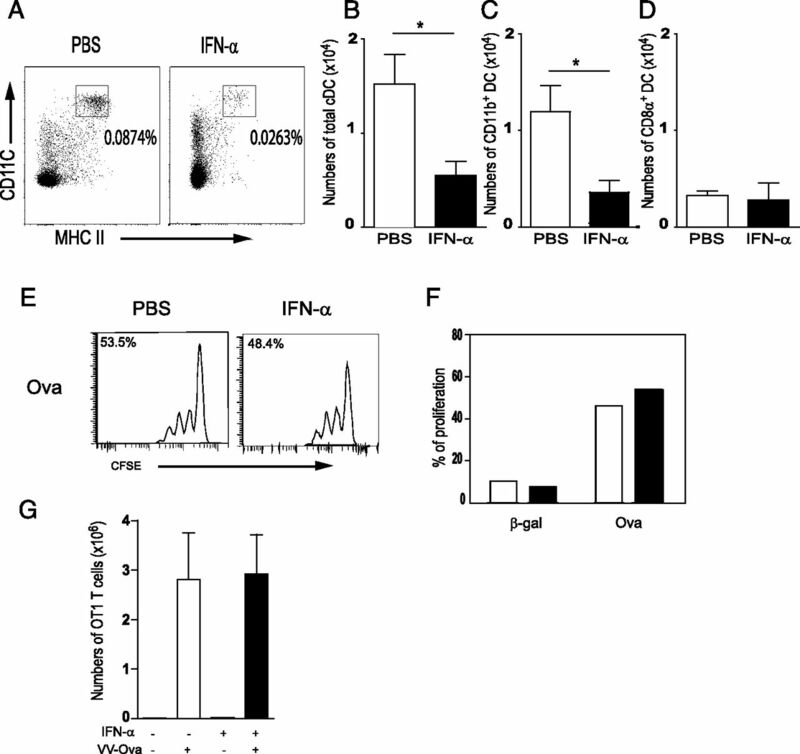 In chronic lymphocytic choriomeningitis virus infection, blockade of type I IFN signaling partially restores antiviral responses. In a mouse model, we tested whether chronic administration of type I IFN, at doses mimicking chronic viral infection, induced immunosuppression. Chronic exposure of mice to IFN-α alone was sufficient to strongly suppress specific CD8+ T cells responses to subsequent vaccinia virus infection. It resulted in the accumulation of Ly6Chi monocytes. These monocytes were similar, phenotypically and functionally, to the myeloid-derived suppressor cells found in cancer because they exerted a potent suppression on CD8+ T cell responses in vitro. They acted at least partly through the l-arginine pathway. In vivo, their elimination restored antiviral CD8+ T cell responses. Our work provides a specific mechanism accounting for the role of IFN-α in immunosuppression and predicts that type I IFN modulation will be pivotal to cure human chronic infections, cancer, or autoimmune diseases. Chronic viral infections induce dysfunctional immune responses and reflect a failure of the host immune system to control viral infection. The mechanisms by which viruses can persist are multiple and may depend on the virus physiopathology. Interestingly, a common feature of many chronic viral infections is a sustained type I IFN signature (1–3). Type I IFN is a well-known family of antiviral cytokines induced early after viral infection. High amounts of type I IFN are induced at the onset of primary infection. The positive roles of type I IFN in this early phase of the response are now well established. They promote viral clearance by different mechanisms including direct antiviral effects, activation of dendritic cells (DCs), NK cells, and enhanced B cell and T cell responses (4). After acute infections resulting in viral clearance, the production of type I IFN is rapidly switched off. On the contrary, persistent infections such as HIV infection in humans, SIV infection in macaques, and chronic lymphocytic choriomeningitis virus (LCMV) infection in mice are associated with a sustained production of low amounts of type I IFN and activation of IFNR-stimulated genes (1, 3, 5, 6). Recently, it was demonstrated that blockade of type I IFN signaling during chronic LCMV infection alleviates viral loads by partially restoring antiviral T cell responses (5, 6), indicating that type I IFN signaling was involved in the immune deficiency taking place during chronic viral infection. It was also shown that myeloid-derived suppressor cells (MDSCs) accumulated throughout LCMV chronic infection and were responsible for poor viral control (7). However, the respective role of type I IFN alone, independently of concurrent viral pathogen-associated molecular patterns or other immune responses, was not known. C57BL/6 J mice were purchased from Harlan Laboratories (France) and used between 6 and 10 wk of age. OT1 and Foxp3-eGFP mice were bred and maintained in the facilities of the Cochin Institute. The Karma mice (a530099j19riktm1Ciphe) (8) were kindly provided by Marc Dalod (Centre d’Immunologie de Marseille-Luminy, Marseille, France) and maintained under specific pathogen-free conditions. Experiments were all conducted according to institutional guidelines and regulations. IFN-α4 was prepared as described previously (9). Mice were first injected s.c. with 105 U of IFN-α4 for 3 d and then for 15–18 d with 104 U. After 18–21 d of IFN-α4 treatment, mice were infected i.p. with 2 × 106 PFUs of vaccinia virus–expressing OVA (VV-OVA; kindly provided by Jonathan Yewdell, National Institute of Allergy and Infectious Diseases, Bethesda, MD). All Abs were purchased from BD Biosciences, eBioscience, or BioLegend. Mononuclear cells were labeled with Abs raised against murine CD8α (53-6.7), CD11c (N418), I-A/I-E (2G9), CD11b (M1/70), NK1.1 (PK136), Ly6C (HK1-4), Ly6G (1A8), CD62L (MEL-14), CD115 (AFS98), CD31 (MEC13.3), CD4 (GK1.5), CD25 (PC61), CD44 (IM-7), CD39 (24DMS1), IA/IE (2G9), CD69 (H1.2F3), CXCR1 (SA011F11), CD223/LAG-3 (C9B7W), CD366/Tim-3 (5D12), TCR-β (H57−597), CD19 (1D3). Abs were used at dilutions of 1:100–500 in cold PBS supplemented with 2% FBS and 0.1% sodium azide for 5 min at room temperature and under shaking. Cells were then washed with 200 μl of PBS and analyzed by flow cytometry. For pentamer staining, mononuclear cells were incubated for 15 min at room temperature with MHC class I pentamers (ProImmune, Oxford, U.K.). Pentamer staining was performed before any additional surface staining. Labeled cells were analyzed on a LSRII flow cytometer using the FACSDiva software (BD Biosciences). Splenocytes from naive C57BL/6 J mice were washed and incubated with or without 1 nM of SIINFEKL peptide for 1 h at 37°C in complete medium. Cells were then labeled with either 0.1 or 1 mM of CFSE in PBS BSA 0.1% for 7 min at 37°C. After washing, cells were diluted to 5 × 106 cells/ml and mixed at a 1:1 ratio, and 10 × 106 total cells were injected into either uninfected or mice infected with VV-OVA. After 4 h, animals were euthanized and peptide-specific depletion of the injected target cells was analyzed by flow cytometry. Percent of in vivo lysis was calculated from the ratio of SIINFEKL-pulsed (CFSElo) to unpulsed (CFSEhi) target cells after normalizing to the ratio of cell populations before injection using the following formula: 100 − ([% peptide pulsed in infected/% unpulsed in infected]/[% peptide pulsed in uninfected/% unpulsed in uninfected] × 100). Cellulose-ester membrane microplates (Millipore) were coated with mAb R4-6A2 (BD Pharmingen). Purified CD8+ T cells from immune mice (105 cells per well) were incubated in these plates for 36 h with stimulator cells consisting of syngeneic splenocytes from naive mice (5 × 105 cells per well), in the presence or absence of 1 μM of SIINFEKL. Plates were washed extensively, and spots were visualized with biotin-conjugated mAb XMG1.2 (BD Pharmingen), alkaline phosphatase–conjugated goat anti-biotin (Vector Laboratories), and 5-bromo-4-chloro-3-indolyl phosphate (Sigma) sequentially. No spots were noted in wells containing stimulator cells alone (in the absence of SIINFEKL). Spleens were digested in RPMI 1640 medium containing 5% FCS, 1 mg/ml collagenase IV (Sigma-Aldrich), and 50 U/ml DNase I (Roche) for 7 min at 37°C. Single-cell suspensions of spleens were prepared by passage through cell strainers (BD Biosciences) and counted. Cells were then stained (MHC class II, CD11c, CD11b, CD19, NK1.1, TCRβ, CD8α) for flow cytometric analysis (LSRII; BD Biosciences) as detailed earlier. The strategy of gating was as follows: gating was done on live CD11chi, MHC class IIhi cells followed by a gate excluding T, B, and NK cells contaminating this population. Expression of CD11b and CD8α was then studied. Numbers were calculated by multiplying the total number of cells by the percentage of the population of interest. For in vitro cross-presentation assay, CD8-α+ DCs were cell sorted from spleens of control or IFN-α–treated KARMA mice. In these mice, CD8-α+ DCs are Tomato+. CD11c+, MHC class II+ CD11b−, Tomato+ were cell sorted (FACSAria III; BD Biosciences). Cells were isolated from OT1 mice lymph nodes, and CD8+ T cells were separated by magnetic beads (Dynal Mouse Negative Isolation Kit CD8 T cells; Invitrogen) and stained with 2 μM of CFSE. CD8-α+ DCs and purified OT1 CD8 T cells were cocultured in complete medium at a 1:5 ratio (DC:T cells) with OVA (Sigma-Aldrich) or β-galactosidase (Calbiochem), both at 0.5 mg/ml in 96-well round-bottom plates for 72 h. Proliferation was measured by CFSE dilution using flow cytometry. For in vivo cross-presentation assays, 2 × 106 purified CD8+ T cells from lymph nodes of OT1 mice were transferred i.v. into CD45.1+ congenic mice 24 h after last IFN injection. Mice were then infected with VV-OVA (2 × 106 PFU, i.p.) 24 h after cell transfer, and CD8+ CD45.1+ cells were enumerated at day 5 postinfection by FACS analysis. Total CD11b+ cells were enriched from spleens of untreated or IFN-α–treated mice via negative selection using CD3, Ter119, B220 Abs, and Dynabeads (Invitrogen). CD11b+ cells were then sorted on FACSAria III (BD Biosciences) into CD11c− CD11b+ NK1.1− Ly6Chi and Ly6G− populations or Ly6G+ populations. The average purity of monocytic cell populations was >90%. Sorted monocytes or polymorphonuclear neutrophils (PMNs) were cultured with 105 CFSE-labeled CD8+ OT1 T cells and stimulated with 5 × 105 SIINFEKL peptide-pulsed splenocytes for 3 d. Inhibitors L-NIL (0.5 mM) or nor-NOHA (0.5 mM) from Calbiochem were added at the beginning of the culture. Untreated or IFN-α–treated mice were injected i.p. with 300 μg of anti–Gr-1 (RB6-8C5; BioXCell) at day −2 and with 200 μg at days −1 and 0 before VV-OVA infection. Efficiency of depletion was verified at day 0 (Supplemental Fig. 3). Statistical significances were determined by Mann–Whitney U test using GraphPad Prism 5. For all significance tested in this article, p < 0.05 was considered significant: ***p < 0.0005, **p < 0.01, *p < 0.05. To study the consequences of chronic exposure to IFN-α alone, we set up an in vivo model avoiding the pathophysiological disorders that could be associated with the use of a replicative virus. We mimicked chronic viral infection in mice by the means of persistent exposure to IFN-α4. This IFN-α has the property to induce the cascade of other IFN-α by promoting IRF-7 expression (10) and is expressed in chronically LCMV-infected mice (3). Mice were first injected with high amounts of IFN-α4 (105 U) for 3 d to reproduce the early phase of the infection by LCMV, during which high amounts of IFN-α are usually found in the sera. Afterward, mice were injected daily with low amounts of IFN-α4 (104 U) for at least another 15–18 d (Fig. 1A) to mimic the chronic phase of LCMV infection, which leads to low IFN expression detectable by quantitative real-time–PCR and undetectable levels in the sera (3). Chronic administration of IFN-α in vivo dampened VV-OVA–specific CD8+ T cell responses. C57BL/6 J mice were treated with IFN-α4 for 21 d before infection with 2 × 106 PFU of VV-OVA. Eight days postinfection, OVA-specific CD8+ T cell responses were analyzed in spleens. (A) Experimental design. (B) Numbers of Kb-SIINFEKL-specific CD8+ T cells in the spleen on day 8 after VV-OVA infection (p = 0.016). (C) Frequencies of IFN-γ+–producing CD8+ T cells in spleens of VV-OVA–infected mice 8 d postinfection. (D and E) Cytotoxic capacity of splenic CD8+ T cells from control or treated IFN-α4 mice on day 9 postinfection expressed as percentages of specific lysis of Kb SIINFEKL pulsed targets (labeled with a lower CFSE concentration) compared with unpulsed targets (labeled with a higher CFSE concentration), determined by in vivo CTL assays. Results are expressed as mean ± SD for three or more mice per group. All data are representative of two or more independent experiments (p = 0.016). *p < 0.05. To investigate the functional impact of chronic exposure to IFN-α on subsequent CD8+ T cell responses, we infected control mice or mice chronically exposed to IFN-α 1 d after the last IFN-α injection with recombinant VV-OVA. OVA-specific CD8+ T cells responses were studied 8 d postinfection in the spleen. Mice chronically exposed to IFN-α displayed lower CD8+ T cell responses to VV-OVA than control mice, as reflected by the number of Kb-SIINFELK pentamer-positive T cells in the spleen (Fig. 1B). The frequency of CD8+ T cells able to produce IFN-γ upon restimulation tended to be lower, but the difference was not statistically significant (p = 0.19) (Fig. 1C). The capacity of the CD8+ T cells to eliminate targets cells preincubated with the OVA-CD8 epitope SIINFEKL was tested by in vivo CTL assays (Fig. 1D, 1E). Chronic exposure to IFN-α led to a poor cytotoxic activity of OVA-specific CD8+ T cells in vivo. We further investigated the consequences of chronic exposure to IFN-α on global T cell response after VV-OVA infection and found, at day 8, that CD8 T cell and, to a lesser extent, CD4 T cell responses were dampened (Supplemental Fig. 1A–C). We studied also the activation state of the CD8 T cells by measuring expression of CD69, CD25, CD44, PD-1, CD223, and CD366 (Supplemental Fig. 1D–I). As expected, at day 8 postinfection, CD8 T cells do not express any more early activation markers (CD69 and CD25) but express CD44 and a low level of PD-1. Expression of CD223 was null, and expression of CD366 was higher on CD8 T cells from control mice. Upon VV-OVA infection, in mice chronically exposed to IFN-α, CD8 T cells were overall less activated and did not display exhausted phenotype. Taken together, these data demonstrate that chronic exposure to IFN-α strongly dampens subsequent antiviral CD8+ T cell responses. Multiple mechanisms can be suggested to explain these decreased CD8+ T cell responses to viral infection after exposure to IFN-α, such as a defect in the naive pool of CD8+ T cells, a defect in the priming of CD8+ naive T cells by APCs, or the generation of CD4+ regulatory T cells. The naive CD8+ T cell compartment in the spleens of mice chronically exposed to IFN-α did not show any significant defect in numbers (Supplemental Fig. 2A). In addition, their proliferative ability was unaffected (Supplemental Fig. 2B). We also studied the generation of CD4+ regulatory T cells by using Foxp3-GFP mice. No effect of IFN-α on either the number or the activation status of these cells was found (Supplemental Fig. 2C, 2D). Given that chronic infections are often associated with a defect in the DC compartment, we next addressed whether the DC pool was affected by a chronic exposure to IFN-α. Conventional splenic DCs can be subdivided into two compartments: CD11b+ myeloid DCs and CD8α+ cross-presenting DCs. Numbers of splenic DCs, CD11b+ DCs, and CD8α+ DCs of control or chronically exposed mice were enumerated. The total numbers of cDCs and CD11b+ cDCs were decreased by nearly 70% by IFN-α exposure (Fig. 2A–C). We also investigated more in-depth the CD8α DCs that are mostly responsible for Ag presentation to anti–VV-OVA CD8+ T lymphocyte (11). Splenic CD8α+ DC numbers remained unchanged upon IFN-α treatment (Fig. 2D). CD8α+ DCs have a unique capacity to cross-prime CD8+ T cells (12, 13). We therefore also tested the effect of IFN-α chronic exposure on the ability of DCs to cross-present OVA in vitro. For this aim, CD8α DCs were cell sorted from control or IFN-α chronically exposed Karma mice on the basis of their Tomato expression. CFSE-labeled purified CD8 T cells from lymph nodes of OT1 mice and the sorted DCs were cocultured for 3 d in the presence of OVA or β-gal as an irrelevant protein. Proliferation of CD8+ OT1 cells was studied by CFSE dilution (Fig. 2E). DCs from control or IFN-α chronically exposed mice display the same capacity to cross-present OVA (Fig. 2F). Effect of chronic exposure to IFN-α on DCs. Splenic DCs from controls or IFN-α chronically exposed mice were analyzed by flow cytometry. cDCs were defined as lin− (TCRb, NK1.1, CD19), CD11c+, MHC class IIhi. (A) Representative dot plot showing percentage of total DCs. (B) Numbers of cDCs (p = 0.049). (C) Numbers of CD11b+ DCs. (D) Numbers of CD8α+ DCs. (E) Representative histograms of CFSE profiles in CD8+ T cells at day 3 of culture. (F) Percentage of proliferating CFSE-labeled OT1 cells after culture with sorted tomato+ in the presence of OVA or β-gal. Proliferation was measured by flow cytometry after 3 d of culture. (G) Two million purified OT1 CD8+ T cells were transferred i.v. into controls or IFN-α chronically exposed mice. At day 1 posttranfer, mice were infected i.p. with 2 × 106 PFUs of VV-OVA. At day 5 postinfection, total numbers of OT1 T cells in the spleens were determined by flow cytometry. Results are expressed as means ± SD for three mice or more per group. All data are representative of two or more independent experiments. *p < 0.05. To test the functionality of the CD8α+ DCs, we also performed in vivo cross-presentation experiments. Control or IFN-α–exposed CD45.1+ animals were transferred i.v. with large numbers (2 × 106) of CD45.2+ congenic OT1 cells and then challenged with VV-OVA. Five days postinfection, we analyzed the spleens and calculated the numbers of splenic OT1 cells (Fig. 2G), which were unchanged by chronic exposure to IFN-α. This result shows that the function of endogenous APCs responsible for the presentation of VV-OVA was not altered by chronic administration of IFN-α. It also strongly suggests that the amount of available Ag after VV-OVA infection at day 22 was not significantly affected by previous chronic exposure to low dose of IFN-α from days 4 to 21. Therefore, even though DCs are key APCs in initiating priming of T cell immune responses, our results show that chronic exposure to IFN-α did not affect the ability of DCs to cross-present Ag in vitro or in vivo, suggesting that these cells were not involved in the dampening of antivaccinia virus CD8+ T cell responses. Abnormal myelopoiesis is often observed in viral chronic infections and cancer (14–16). This led us to study further other components of the myeloid compartment (PMNs and monocytes/macrophages) in mice chronically exposed to IFN-α. In mice, monocytes and PMNs can be distinguished by the expression of Ly6G (Fig. 3A). Monocytes (CD115+, CD11b+, CD11c−, NK1.1−, Ly6G−) can be further divided into two main subsets based on the expression of Ly6C, CCR2, and CX3CR1. Ly6Clo CX3CR1hi monocytes, also called “patrolling monocytes,” are mainly in the blood. They can extravasate into inflamed tissues and promote transient innate responses, whereas Ly6Chi CCR2+ monocytes, also called “inflammatory” monocytes, are involved in the control of bacterial infection by their ability to produce strong amounts of TNF-α and to secrete NO (17). IFN-α promoted the accumulation of Ly6Chi monocytes. Spleens from PBS- or IFN-α–treated C57BL/6 J mice were isolated after 21 d of treatment. (A) Gating strategy to distinguish monocytes and neutrophils. (B) Representative dot plot showing myeloid cells gated on CD11c− NK1.1− CD11b+ cells. (C, two left panels) Expression of MHC class II and CD62L on DCs and Ly6Chi monocytes (histograms: light gray, gated on CD11c+ CD11b+ DCs; dark gray, Ly6Chi monocytes from control mice; black, gated on Ly6Chi monocytes from IFN-α–exposed mice). (C, two right panels) Expression of CCR2 and CD115 on Ly6Chi monocytes (histograms: light gray, FMO; dark gray, Ly6Chi monocytes from control mice; black, Ly6Chi monocytes from IFN-α mice). (D) Total numbers of splenic polynuclear neutrophils. (E) Total numbers of Ly6Clo CD115+ CX3CR1hi monocytes (p = 0.028). (F) Total numbers of Ly6Chi CCR2+ monocytes (p = 0.028). *p < 0.05. Upon chronic exposure to IFN-α, we found a major increase of monocytes expressing high levels of Ly6C (Fig. 3B). We further defined their phenotype as MHC class II−/lo, CD62L+, CCR2+, CD115+ (Fig. 3C). Upon chronic exposure to IFN-α, we found no change in the numbers of splenic PMNs (Fig. 3D), whereas numbers of Ly6Clo CX3CR1hi monocytes were strongly reduced (p = 0.03) (Fig. 3E). We also confirmed accumulation of Ly6Chi CCR2+ monocytes as their numbers were strongly increased (p = 0.028) (Fig. 3F). Interestingly, we also noticed a strong upregulation of CD31+ (PECAM-1) cells in the “inflammatory” monocyte pool after IFN-α treatment. Nearly all the monocytes Ly6Chi express this marker after treatment (Fig. 4A, 4B). The expression of this molecule is associated with immaturity of myeloid cells and has been used to characterize MDSCs in cancer (18). In cancer models, MDSCs are a heterogeneous population encompassing both PMNs and monocytes (14). We thus tested whether Ly6Chi monocytes or PMNs found in IFN-α chronically exposed mice were able to suppress CD8+ T cell proliferation in vitro. Splenic Ly6Chi monocytes or PMNs were sorted from control or IFN-α chronically exposed mice and added at different ratios to cultures of APCs with peptide and with CFSE-labeled OT1 cells. CFSE profiles (Fig. 4C) or calculation of the percentages of proliferation (Fig. 4D) indicate that proliferation of OT1 cells was suppressed proportionally to the number of Ly6Chi monocytes from IFN-α–exposed mice added to the culture. Ly6Chi monocytes from control mice were unable to suppress OT1 proliferation. Sorted PMNs were not able to suppress CD8+ T cell proliferation even at a ratio of 1:1 (Fig. 4E). It was surprising to find this suppression because IFN-α is a good adjuvant when used acutely at the initiation of the immune response (9, 19). We therefore also studied splenic Ly6Chi monocytes sorted from controls or mice acutely exposed to IFN-α (at high dose for 3 d). We found that these cells had no suppressive capacity (Fig. 4F). Therefore, promotion of suppressor monocytes is a unique feature of chronic exposure to low doses of IFN-α. Accumulated Ly6Chi monocytes were suppressive. (A) Expression of CD31 gated on splenic Ly6Chi monocytes. (B) Percentages of CD31+ cells among Ly6Chi monocytes. Results are expressed as mean ± SD for three or more mice per group. All data are representative of three independent experiments (p = 0.028). In vitro suppression assays. (C) Representative CFSE profiles of purified OT1 CD8 T cells cultured for 3 d with APCs (5 × 105) ± SINNFEKL peptide ± Ly6Chi monocytes from control or IFN-α–exposed mice. (D–G) Percentages of proliferation of CFSE-labeled purified OT1 T cells (1 × 105) cultured with APCs and with or without SIINFEKL peptide. (D) Sorted Ly6Chi monocytes from untreated or IFN-α–exposed mice were added to these cultures at the indicated ratios (p = 0.05 at 1:2 and 0.0383 at 1:4). (E) Sorted Ly6G+ PMNs from untreated or IFN-α–exposed mice were added to these cultures at the indicated ratios. (F) Sorted Ly6Chi monocytes from untreated or acutely IFN-α–exposed mice were added to these cultures at 1:2. (G) Same as in (D), but inhibitors of iNOS (0.5 mM L-NIL) or of Arg-1 (0.5 mM nor-NOHA) were added to the culture (p = 0.05 between media and nor-NOHA, p = 0.05 between media and L-NIL). All data are representative of two or more independent experiments. *p < 0.05. In cancer models, several reports have shown the key role played by the l-arginine pathway in the suppression of T cell responses by MDSCs (20). l-Arginine is a nonessential amino acid playing a central role in several biological systems including proliferation of T cells. l-Arginine is the substrate of two enzymes: arginase-I, which destroys l-arginine, and inducible NO synthetase (iNOS), which converts l-arginine into citrulline and NO, thereby limiting availability of l-arginine and/or inducing T cell apoptosis. To test whether this pathway was involved in the suppression of CD8+ T cells by IFN-α–induced monocytes, we added specific inhibitors of either arginase-I (NOHA) or iNOS (L-NIL) to our cultures. NOHA was significantly but poorly able to rescue the proliferation of OT1 cells in the presence of splenic Ly6Chi monocytes purified from mice chronically exposed to IFN-α, whereas L-NIL fully restored OT1 cell proliferation (Fig. 4G). 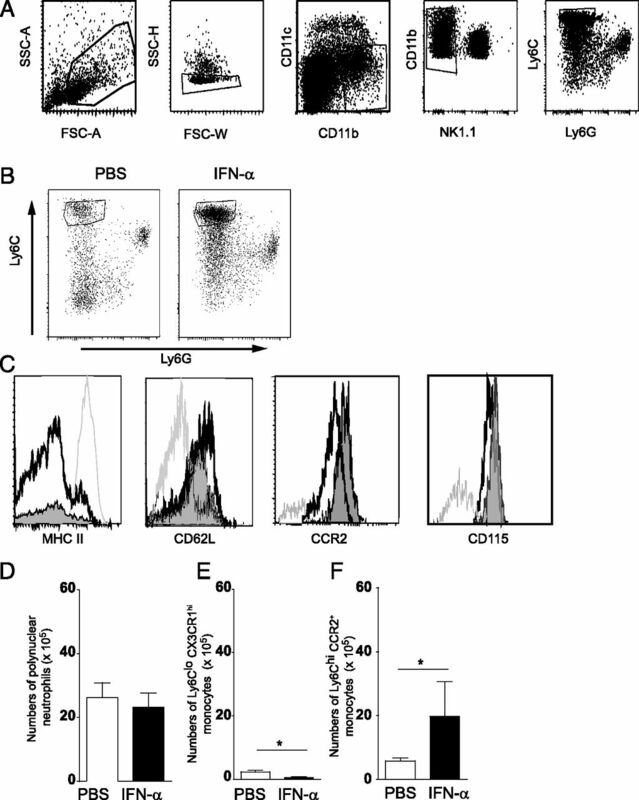 These data strongly suggest that the l-arginine pathway and in particular the iNOS pathway is involved in the mechanism by which IFN-α–induced monocytes suppress CD8+ T cell responses. These results show that IFN-α by itself induced MDSCs acting, at least in part, through the l-arginine pathway to suppress CD8+ T cell responses in vitro. It was shown that chronic LCMV infection induces suppressor monocytes and a poor antiviral-specific CD8+ T cell response in vivo (7). Therefore, we tested whether monocytes induced by chronic exposure to IFN-α by itself would really be responsible for poor antiviral-specific CD8+ T cell response in vivo. Given that PMNs were neither accumulated nor suppressive, we used anti-Gr1 Abs for in vivo depletion of monocytes (and PMNs) (Supplemental Fig. 3). We compared anti-OVA responses of control or IFN-α chronically exposed mice, depleted or not of monocytes/PMNs by several injections of anti-Gr1 Abs at day −2, day −1, and on the day of infection with VV-OVA. Endogenous OVA-specific CD8+ T cell responses were studied at day 8 postinfection in the spleen by measuring SIINFEKL-H-2Kb pentamer-labeled cell numbers (Fig. 5A) and in vivo–specific cytotoxic activity (Fig. 5B). Depletion of Gr1+ cells had no impact on control mice, as illustrated by the number of Kb-SIINFEKL pentamer+ cells or percentage of specific lysis. However depletion of Gr1+ cells in IFN-α chronically exposed mice led to a complete restoration of the antiviral CD8+ T cell responses, with comparable numbers of pentamer+ CD8+ T cells and comparable cytotoxic activities of the CD8+ cells to those of control mice. These results allow us to conclude that MDSCs generated by the chronic administration of IFN-α were fully responsible for the poor antiviral response. Depletion of Gr-1+ cells in vivo fully restored VV-OVA–specific CD8+ T cell responses. 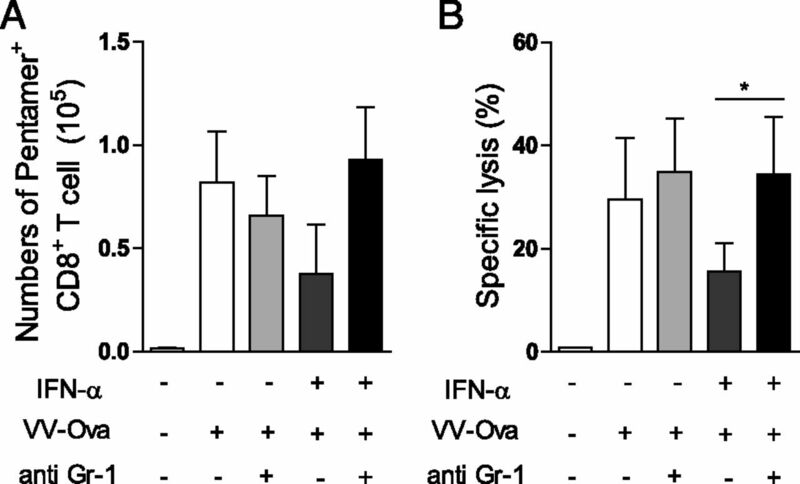 Control or IFN-α4–exposed mice received anti–Gr-1–depleting Abs at day −3, day −2, and on the day of infection with 2 × 106 PFUs of VV-OVA. (A) Total numbers of Kb-SIINFEKL pentamer+ CD8+ T cells in the spleen on day 9 after VV-OVA infection. (B) Cytotoxic capacity of splenic CD8+ T cells from control or IFN-α4–treated mice on day 9 postinfection expressed as percentages of specific lysis of Kb SIINFEKL-pulsed targets determined by in vivo CTL assays (p = 0.0317). Results are expressed as mean ± SD for three or more mice per group. All data are representative of three independent experiments. *p < 0.05. The data presented in this article show that after repeated exposure to IFN-α at doses similar to the natural dynamics of production of type I IFN during the course of chronic LCMV infection, mice were immunosuppressed regarding their ability to mount efficient CD8+ T cell responses to vaccinia virus infection. Chronic infection by LCMV had already been shown to induce an immune suppression, hampering responses to LCMV itself, and it was therefore used as a model for AIDS (21). A persistent IFN signature is a hallmark of pathogenic chronic HIV, SIV, and LCMV infections (1, 3, 22). Recently, restoration of immune responses against LCMV by specific inhibition of type I IFN signaling demonstrated that these IFNs were necessary to the suppression found in this infection at onset of infection (5, 6). In these two reports, it was shown that blockade of IFNR before infection with chronic LCMV clone 13 allowed better viral control by promoting enhanced CD4 T cells responses and IFN-γ production. In another report it was shown that chronic LCMV infection induced expansion of myeloid suppressor cells able to inhibit LCMV-specific CD8 T cells responses (7), but no link was made with sustained type I IFN. The crucial step made in this work is the demonstration that type I IFN on its own, at doses mimicking chronic viral infection, is sufficient to induce strong immune CTL suppression in vivo. Different mechanisms by which sustained exposure to type I IFN may induce immunosuppression were explored and ruled out, such as an effect on naive CD8+ T cells or on the induction of regulatory CD4+ T cells. However, sustained exposure to IFN-α had a drastic effect on the conventional DC pool as shown by a massive reduction of cDC numbers. This reduction of cDC numbers is also characteristic of chronic viral infections such as HIV and SIV (23–25). Therefore, our experimental model consisting of repeated injections of physiological doses of IFN-α reproduces one of the main features of human systemic viral chronic infection on cDC homeostasis. There was nonetheless a difference with HIV, SIV, and chronic LCMV infections, where the CD8α+ DC population, or its human or simian equivalent, is also reduced (26–28). After sustained exposure to IFN-α, CD8α+ DCs had normal numbers and function, because they were fully able to cross-present Ag both in vitro and in vivo. These results suggested that CTL immunosuppression was not due to DC impairment. We report that the immunosuppression induced by sustained exposure to IFN-α was mediated by the accumulation and action of suppressor monocytes. Recently, it was also shown that chronic LCMV infection promoted the expansion of MDSCs (7), including monocytes and neutrophils. Sustained exposure to IFN-α induced only the expansion of Ly6Chi monocytes, whereas the expansion of neutrophils in LCMV infection may involve additional viral or immune factors. Monocytic MDSC expansion has also been reported in other chronic infections, including HIV and SIV (29, 30). In all reported chronic infections that induce CTL immunosuppression trough monocytic MDSCs (HIV, SIV, or LCMV), MDSCs inhibit CD8+ T cell expansion through the l-arginine pathway mainly through iNOS. This was also the case after sustained exposure to IFN-α. Our data demonstrate that chronic administration of type I IFN is sufficient to induce on its own a strong immunosuppressive program through MDSC accumulation and activation leading to poor immune response to subsequent infection. Therefore, targeting MDSCs themselves (7) or type I IFN responses through type I IFN–specific Abs or antagonists in chronic viral infections results in better viral control by restoring immune antiviral responses (5, 6). Conversely, type I IFN have been used therapeutically in HBV and HCV infections, and recent data indicate that they may improve viral reservoir control in complement to antiretroviral therapy during HIV infection (31). This apparent contradiction illustrates well the complexity of the type I IFN system and the importance of the doses used. Indeed, sustained low doses of type I IFN result in suppression, whereas high doses boost antiviral immune responses. In chronic viral settings, whether it is better to administer high doses of type I IFN or, on the contrary, to block type I IFN signaling should be clinically investigated. In any case, it is now predictable that type I IFN modulation will be pivotal to improve treatment of human chronic infections, cancer, or autoimmune diseases. We thank Georges Bismuth and Bruno Lucas for advice and critical reading of the manuscript; the Institut Cochin Animal Facility, in particular Nadia Boussetta, Yoann Mavounza, Matthieu Benard, and Otilia Le Gall; the Cytometry and Immunobiology Facility for maintaining the flow cytometers; Jonathan Yewdell (National Institute of Allergy and Infectious Diseases) for the gift of VV-OVA; and Marc Dalod for the gift of Karma mice. This work was supported by INSERM, CNRS, Université Paris Descartes, Sorbonne Paris Cité, Institut Cochin, the French Government’s Investissement d’Avenir program, Laboratoire d’Excellence Integrative Biology of Emerging Infectious Diseases (Grant ANR-10-LABX-62-IBEID), and Agroparitech.
. 2012. Systems biology of natural simian immunodeficiency virus infections. Curr. Opin. HIV AIDS 7: 71–78.
. 2006. Type 1 interferons and the virus-host relationship: a lesson in détente. Science 312: 879–882.
. 2009. 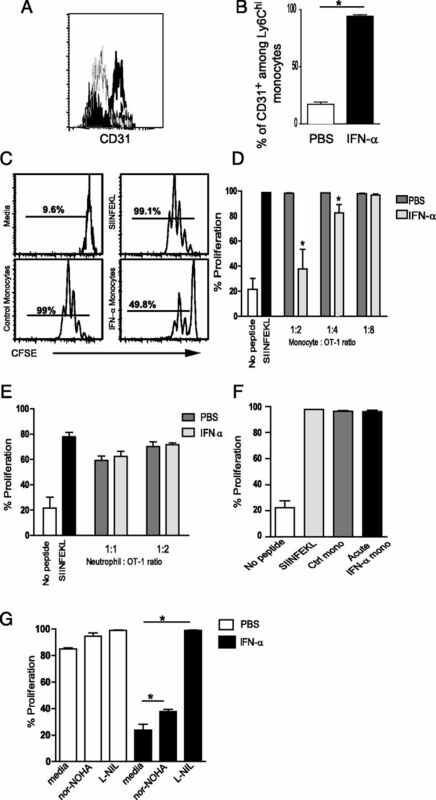 Multiple mechanisms contribute to impairment of type 1 interferon production during chronic lymphocytic choriomeningitis virus infection of mice. J. Immunol. 182: 7178–7189.
. 2002. Links between innate and adaptive immunity via type I interferon. Curr. Opin. Immunol. 14: 432–436.
. 2016. XCR1+ dendritic cells promote memory CD8+ T cell recall upon secondary infections with Listeria monocytogenes or certain viruses. J. Exp. Med. 213: 75–92.
. 1998. Differential viral induction of distinct interferon-alpha genes by positive feedback through interferon regulatory factor-7. EMBO J. 17: 6660–6669.
. 2004. Cutting edge: conventional CD8 alpha+ dendritic cells are generally involved in priming CTL immunity to viruses. J. Immunol. 172: 1996–2000.
. 2012. Cross-presentation by dendritic cells. Nat. Rev. Immunol. 12: 557–569.
. 2013. Myeloid-derived suppressor cells: the dark knight or the joker in viral infections? Immunol. Rev. 255: 210–221.
. 2000. Identification of a CD11b(+)/Gr-1(+)/CD31(+) myeloid progenitor capable of activating or suppressing CD8(+) T cells. Blood 96: 3838–3846. 2007. Pathways mediating the expansion and immunosuppressive activity of myeloid-derived suppressor cells and their relevance to cancer therapy. Clin. Cancer Res. 13: 5243–5248. 1988. Virus-triggered AIDS: a T-cell-mediated immunopathology? Immunol. Today 9: 370–372.
. 2009. Nonpathogenic SIV infection of African green monkeys induces a strong but rapidly controlled type I IFN response. J. Clin. Invest. 119: 3544–3555.
. 2006. Type I interferon production in HIV-infected patients. J. Leukoc. Biol. 80: 984–993.
. 2001. Reduced blood CD123+ (lymphoid) and CD11c+ (myeloid) dendritic cell numbers in primary HIV-1 infection. Blood 98: 3016–3021.
. 2002. Dendritic cells in innate immune responses against HIV. Curr. Mol. Med. 2: 739–756.
. 1995. Virus-induced immunosuppression: immune system-mediated destruction of virus-infected dendritic cells results in generalized immune suppression. J. Virol. 69: 1059–1070.
. 2012. Pivotal role of M-DC8+ monocytes from viremic HIV-infected patients in TNFα overproduction in response to microbial products. Blood 120: 2259–2268.
. 2014. TLR3-responsive, XCR1+, CD141(BDCA-3)+/CD8α+-equivalent dendritic cells uncovered in healthy and simian immunodeficiency virus-infected rhesus macaques. J. Immunol. 192: 4697–4708.
. 2013. Pegylated Interferon alfa-2a monotherapy results in suppression of HIV type 1 replication and decreased cell-associated HIV DNA integration. J. Infect. Dis. 207: 213–222.